When looking for a tree removal company, you might want to consider Totally Trees. We can have your property looking better than ever. The process can be quite complicated. It most times requires a professional to help plan out a safe and non destructive process. Totally Trees has been serving both Michigan and Florida locations for the past decade. We offer a full line of tree services. Create a clean look for your property. Simply have some problematic unsafe areas removed. Rotting or decaying branches and trees can become a safety hazard. As a result, this can create a real danger for your family, property, or home. Therefor by removing these safety concerns, it will help give you piece of mind. Creating a safer place for your family or friends to enjoy. If you want a a price for tree removal, you can get one here. We are here to help. Call us today for a no cost analysis and no down payment to get started. Reclaim your property from the storm. Feel safe entering your property again, knowing that all tree hazards have been taken care of by a professional tree service company. Victim of Hurricane Michael and need financial assistance, shelter, or legal advice? Check out all the info on our Panama City page here. 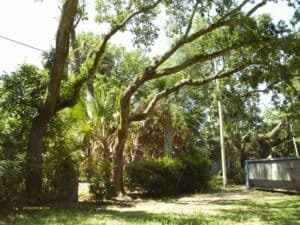 Are you looking for a tree removal company in Pensacola? Totally Trees can help with that. Make sure that you have gathered enough information to get going. Below is an example of how to start getting your free estimate. First of all, you want to make sure you identify the problematic areas that are of concern to you. Your next step, is to give a professional tree company a call. One of them can be Totally Trees. We always give free estimates. Customers receive their estimate for the work to be done, usually a couple of days after the appointment. Finally, there is only one thing left to do. Time to decide what work you want done. In addition, once the appointment day arrives, prepare your Pensacola property for the work that is going to be done. Branch tree removal customers know to call Totally Trees. We love to keep their property beautiful and safe for years to come. Our teams will manage your tree removal process from start to finish. Totally Trees is rated one of the best tree removal companies in Michigan and Florida. Have your property looking great by removing your decayed, overgrown, or unsightly trees. With tree removal Ludington customers have always been impressed with our customer service. Probably because we take great pride in our ability to safely clean up and create a safer place for you, family, and guests. We offer a variety of tree removal service to Ludington customers. With over almost two decades serving Ludington, MI, you can be rest assured your project is in the hands of professionals. Call or fill our form today for your free estimate! Looking for a Manistee tree removal company? Give a call to a professional tree service company. Totally Trees has been helping Manistee customers beautify and create safer homes and properties for years. In Manistee, the tree removal process is fairly easy to get started with. First identify the areas near your home or property. Next, give us a call or fill out or form online, to get your Totally Free tree estimate.